Windows 8 does not install Purble Place game which children love to play on Windows 7 and on Windows Vista. Fortunately, you can install Purble Place on Windows 8 and play Purble Place game on Windows 8 or Windows 8.1 computers too. Please follow below instructions that makes Purble Place game available to Win 8 users. If you have already a Windows 7 computer, instructions will show you how to copy Purble Place from Windows 7 and complete setup on Windows 8 before you start to play Purble Place on Win8 PC. Following download of Purble Place game is taken from Windows 7 operating system, you can download and install it on a 32 bit or 64 bit Windows 8 or Windows 8.1 PC. Total download size is around 170 MB. Please scan the downloaded files using a software security tool for your own system safety to prevent undesired problems. After you download Purble Place for Windows 8 setup, please follow the instructions given at Download Purble Place and Play on Windows 10 for completing the installation. An other option is to install Purble Place game for Windows 8 and Windows 8.1 32-bit computers. Purble Place game download for PurblePlace-Windows8-X86.rar and follow the below setup instructions explained in the following section. If you have downloaded Purble Place from 64-bit Windows 7 computer (or related download package PurblePlace-Windows8-X64.rar), first of all open Windows 8 installation drive using File Explorer. If Win8 is installed on C drive, go to "C:\Program Files" folder. By default "Microsoft Games" folder does not exist. Create a new folder and name it as "Microsoft Games". Then move "Purble Place" folder and its all content under "Microsoft Games" folder. Current 64-bit download has localization support for English, German and Turkish at the moment. If you own a 32-bit Windows 8 running PC, you should have downloaded the setup file PurblePlace-Windows8-X86.rar. Extract the .rar file on desktop. 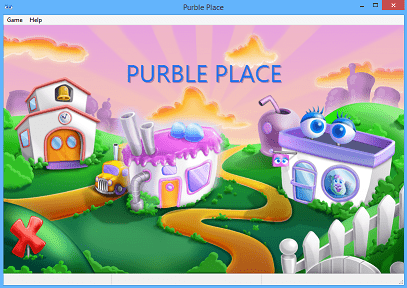 When you are asked for the rar file password please use "purbleplace"
A new folder titled as "Purble Place" with Purble Place game binaries will be created. Open Windows Explorer and go to Windows 8 installation drive. Then go to "Program Files" folder. If "Microsoft Games" folder does not exist, create a new file folder and name it as "Microsoft Games"
Now you can move the "Purble Place" folder into "Microsoft Games" folder. 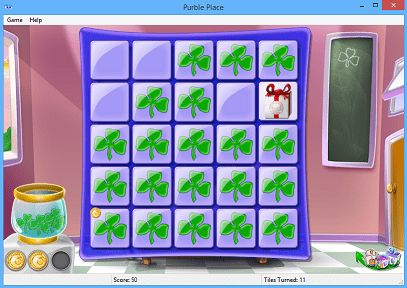 You can now launch the Windows 7 Purble Place game on Windows 8. Current 32-bit download has localization support only for English right now. Just a short note on Purble Place, I realized that many of us or at least children of us are loving Purbles and live the fun of playing Place Place game on Windows 7 or Microsoft Windows's previous version Windows Vista. 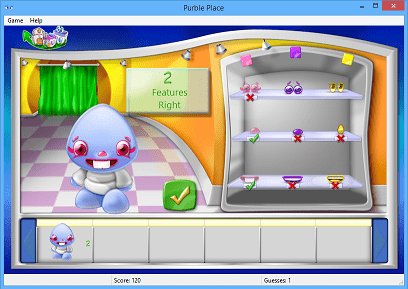 Since the first appearance of Purble Place with Windows Vista, this game is loved very much among kids. Parents, relax and do not worry about your kids because they are playing Purble Place. Purble Place is an entertaining and also an educational game for children with especially the Purble Pairs and Purble Shop games. Purble Pairs is a matching pairs memory game. Your kids will be matching pairs of tiles (actually lovely images of Purbles and accessories) while improving their memory skills and concentration beyond. Purble Shop is infact a version of Master Mind game which requires intelligent players especially for high difficulty levels. 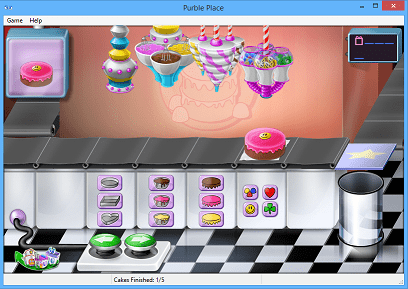 Comfy Cakes is a cake baking game which is the most fun game among Purble Place game for girls. For details on how to play Purble Place game, please read my previous post about this marvellous game Purble Place. The game review article has a section for how to play Purple Place games.